Back in 1987 I was a seventeen year-old punk teenager with a bad attitude and big hair. If you also grew up in that era, I’ll bet your hair looked as funny as mine. Then again, maybe it didn’t. 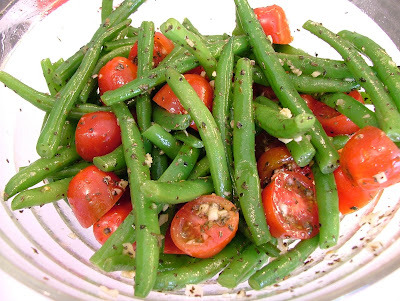 The variety of ‘80s hairstyles equals the number of different ways to cook green beans. Back in those days I used to like canned beans. I was also down with the music of New Order. Today, New Order tunes still provide me with a welcome sense of nostalgia while canned beans turn me off and bring on a series of questions. Like, why did I find them so appealing? And why did I also enjoy baloney, raw hot dogs and Velveeta cheese (is it really cheese?). On this cooking experience I took a walk down nostalgia lane with New Order’s Substance CD. The songs Perfect Kiss, Blue Monday and Everything's Gone Green had me moving to the beat as they blared in the background. 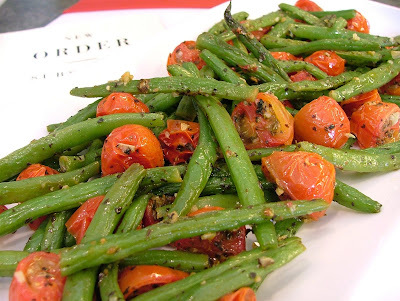 Their synthesized sound brought back unforgettable memories (and some forgettable ones) while I roasted this complimenting mix of green beans cherry tomatoes, basil and garlic. I could have also added potatoes to the mix but then things would have started to get out of control…did I mention my ‘80s coiffure. I’m happy to report that both my hairstyle and taste in food has improved over the years. Otherwise this would have been a roasted green bean, baloney and hot dog dish smothered in Velveeta cheese. Hang on…that might be good! Oh crap, I’m regressing. In a steamer basket or large saucepan of boiling water, cook beans until slightly tender, about 3 minutes. Drain beans and pat dry. 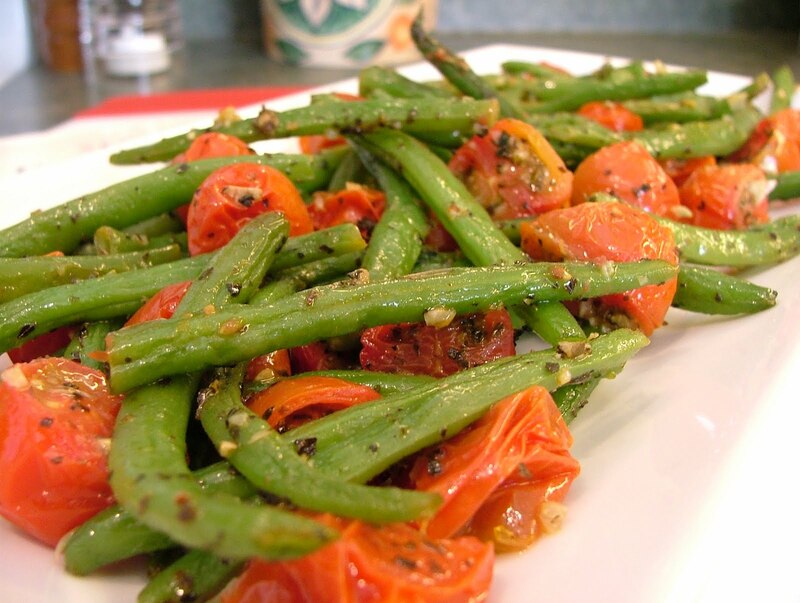 In a large bowl, combine cooked beans, tomatoes, garlic, basil and oil. Season with salt and pepper. Toss to coat. Place mixture on a rimmed baking sheet that has been lined with foil or sprayed with cooking spray. Roast in a 400º F oven until tomatoes begin to break down, about 8 minutes. Transfer to a serving dish and serve. Sounds delicious, I admit I was too young to have crazy hair in the 80s. Though not too young to desire it! This sounds so good. My fiance's grandmother just brought us up some green beans yesterday - this may be the perfect way to use them up.